Now, I wonder if many of you out there, has the same sentiments as me. 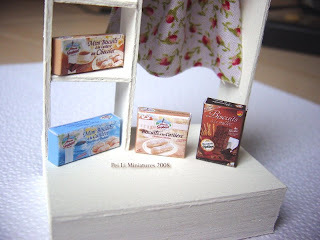 It is really hard to find high quality, pretty, elegant 1:12 Miniature Biscuit Boxes. I've looked at online shops, but the boxes they sell are not to my liking. They are mostly vintage boxes, but sometimes we just need something more contemporary for our kitchen or grocery cupboard. I've also looked at websites that offer free printies, and have tried their print outs but I felt something is lacking. So, during the holiday weekend, I decided to make some of my own. By the way, it's NOT ok to take an original product box, make them into miniatures and sell it. It's actually infringement of copyright. I truly enjoyed making them....and I decided to share them with you. Drop me a comment with your email address and I'll randomly draw a name on Sunday, 2 Nov. I will send these 4 biscuit boxes to you! You know, I would love to see what you do with my biscuit boxes too. If you can take a photo to show me how they are being used, it will be so awesome! If you like them, I shall periodically make some more (and other new ones too, if time permits) and offer them as free giveaways. I have been looking around for a pretty ipod cover for quite some time. But unfortunately, I just could not find anything to my liking. Hence, I decided to make one myself. I spent Saturday night putting my collection of quilting fabrics into good use (finally!). I have been collecting pretty fabrics for the longest time, but just haven't found a good chance to use them. I made one for my mobile phone too! I bought some new materials over the week, and wanted to try them on the display shelf. See the heart shape lace? I painted it and pasted it on the shelf. I was pleased with the result. Black is a colour I often refrain from using in my work. It's just not a color I automatically think of to paint anything. But this time round, I wanted to try something different from the usual pastels. So my cake display shelf is painted in black. I like the different effect it gives. Stick cakes are still unknown locally, but in Japan and Hong Kong, this is pretty popular. I've not eaten them personally, but I've heard that they don't taste different from other cakes. I think it must have been originated from Japan. If I recall correctly, I read that they made it thin, so that people could just buy and eat while walking, unlike for regular cake slices, you need to sit down to eat it. 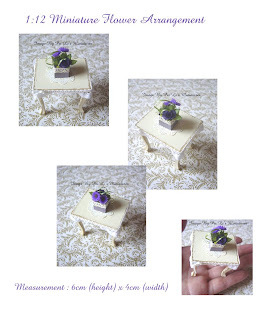 When it comes to 1:12 miniatures, stick cakes are pretty time consuming to make. They are small in width, but attention and detail has to be given nevertheless. They needed to be added on layer by layer, and more work is especially done for blueberry, framboise & mango cake. This time, gold flakes were also used on them. Each piece of stick cake is approximately 3mm in width, and 1.2cm in length. It's a bit hard to put into perspective how big the cakes are in reality, so I shall remember to do a coin comparison with the stick cakes next time. I had some leftover materials from making the black display shelf, and so I decided to make another beige one. The beige shelf has been given to my friend. This piece measures 5.5cm (height) x 9cm (width). Thanks to all for voting in my poll! Keep the votes going! I appreciate it much! I have been very busy still, and have been making another alternative design for christmas. It's coming along nicely. I want to share with you all a really nice picture. 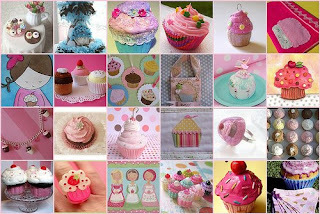 It's madeup of all the interesting vendors who make cupcakes related handicrafts at Lollishops. I'm one of them! Can you spot my miniature cupcakes?! I have added a new poll to better understand all my readers of this blog. I invite all of you to take the poll. :) Even if you have just been reading my blog and not leaving a comment, please take a moment to join in the poll. On this trip, I experimented using a lot of colours that I usually wouldn't use - Purple for example is one. You will also witness in another piece of work later. In this piece, I tried dark purple for the rose, and a brighter purple for sunflower.